EC: Tell us something about your blog and the reasons and inspiration behind starting it. Supriya: First of all thank you EC for giving me the opportunity to talk about me and my blog. I have been blogging since July 2007 and so RedChillies is about 2.5 years old. After I took up the mantle of cooking I discovered that I enjoy cooking, experimenting and also trying out new dishes. When I found the medium of food blogging I decided to use this platform as a way of keeping track of my recipes (more like an online cookbook) in an organized way, recording my experiments, mis-trials etc. Currently blogging has become my passion and I am enjoying it very much. It must have been about 3-3.5 years ago that I discovered food blogs through some Google searches and had been hooked onto them. I loved the concept of presenting recipes through photography, narration, musings, user interaction etc. After seeing many Indian food blogs amongst them, I thought why not give it a try myself? After all food is a part and parcel of daily life and there is something cooking in our kitchen everyday. So I started blogging as a way of recording my recipes and culinary adventures. Initially I started out privately, but after some nudging and encouragement from my husband I decided to make the blog public. EC: How frequently do you post, do you cook specially for the blog? Supriya: Now that I am caught up in this whirlwind of blogging I try to post twice a week, (depending on my schedule). As I have said before I have zeal for learning and trying out new recipes, and now that I blog that cooking interest gets intensified. Now add photography to that equation and the enthusiasm gets compounded. EC: Food world aggregator is a boon to the food blogging community. Tell us something about how you came up with this idea and the efforts behind it. Supriya: Thank you and I am glad that this effort is able to bring the bloggers together. The idea of FoodWorld was inspired by FBD (another blog aggregator) started by Indira, Mathy and also TOI started by Sailu. When I was new to the world of food blogging I found FDB, TOI to be useful to make my blog known not only to the other like-minded bloggers but also to a wide range of interested audiences. When FBD closed down, I thought why not give it a try and create one myself? Luckily I succeeded and that is how FoodWorld got created. It is an aggregator and is an opportunity to provide free platform for other food bloggers to showcase their work to wider audience. Supriya: Thank You. I am still a beginner and I have a long way to go. I believe that photography skill comes through experience and experimenting. There are lots of articles, videos on the web that I find very useful. You can find some of the links here. It is very important to go through the cameras manual and try out the different modes. · Just changing the mode from “Auto” to “Portrait” or “Macro mode” makes huge difference. · Take time to think through the setup, look at some food magazines, and online websites like TasteSpotting for inspiration, ideas on the setup. · Take pictures in bright natural light as far as possible. Do not add the flash. · Take lots of pictures of food from different angles, not just from the top. It is important to bend and take a picture from top level of the food container. This gives some depth to the pictures and does not make it appear flat. · Use glass cutlery as far as possible. This works well for me as I have not had good results using steel or transparent glass containers. · Last but not the least, use editing software to crop out unnecessary part and change the brightness, contrast of the picture as required. EC: How do you manage to keep posting on your blog, the aggregator and your daily chores as well? EC: Have your recipes or pictures been copied anywhere without your permission. How would you deal with plagiarism?? Supriya: To be quite frank, I am not aware if my pictures or recipes have been copied elsewhere. On the same token I do have to mention that I feel very strongly and critical about plagiarism. I feel that stealing content from other sources without permission is just outrageous. It is just day light robbery and cannot be tolerated. It annoys me no end when people steal our content, threaten us and publish it as their own. I just cannot understand as to why people do not ask permission or give credits to the original creator. EC: To what extent one must have technical knowledge for blogging? Supriya: I don’t think technical knowledge is necessary for basic blogging. Just simple know-how is sufficient to start off with blogging. The platforms like Wordpress, Typepad and Blogger are user friendly and pretty easy to use. However if additional changes are necessary to the design/template then a good bit of technical knowledge especially HTML helps. There are lots of free on-line tutorials and it is not that difficult to learn. Supriya: I think this is the toughest question so far. I have about 200+ vegetarian recipes in my blog and picking just one is tough. 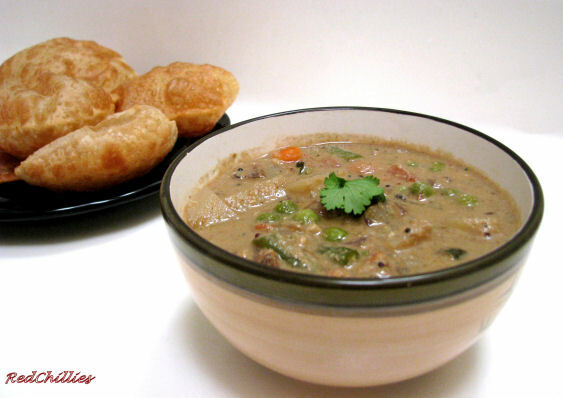 However I would gladly settle for this one: Poori and Vagetable saagu, my all time favorite. That was so nicely done EC. Knowing more about supriya feels good. Thank you for bringing up the photographic techniques, it is such a useful information. Glad to know more about Supriya..love her blog, she was one of my inspiration..keep rocking supriya.. Thank you EC for including me in this series. I enjoyed doing this. Thank you EC & Supriya. I admire her great work behind her blog and the aggregator. Enjoyed knowing you Supriya,Great Job EC.